For the next few weeks I’m at a course on Monday nights, which makes it impossible for me to watch Glee – that all important Monday night TV fixture – in its regular 9pm slot. On my way home last week I checked Facebook and Twitter and spotted a variety of Glee related messages that made me all the more determined to make it back in time for the 10pm E4+1 showing. (i) My sister said, on the night it was shown, that she reckoned I’d blog about it within 24 hours. (ii) I disagree with the twitter theologian above. 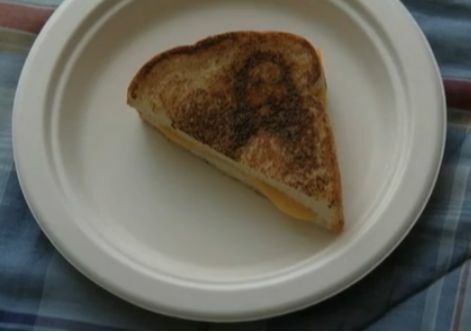 This episode managed to highlight a number of religious issues, from the separation of religion & state that’s held so sacred in America, to the importance of religious heritage, via the church’s attitude to homosexuality – all within a storyline that centred upon a grilled cheese sandwich with the face of Jesus on it. [The grill hadn’t grilled properly ever since Finn used it to dry his sneakers.] Finn chooses to pray to Jesus-of-the-sandwich and declares his new found faith (and desire to sing songs about it) to his fellow classmates – and thus the episode begins. So what have I got to add to the mix? First off, the regular beginning of episode scene set in the glee club classroom has to contain some of the best one-liners of the series and at the same time illustrate diverse religious attitudes and opinions that you’d find in any classroom. You know what this episode is really about? It’s not evangelism, or stuffing faith down the throats of those that don’t want to hear (which is most definitely not the same as evangelism) – it’s about prayer. Kurt’s father Burt has a heart attack and lies in a coma. [It wasn’t until I looked this episode up on Wikipedia that I realised their names rhymed! Such is the subtle genius of Glee.] He’s an atheist and when his religious friends vow to pray for his father, he refuses their support. Ultimately, he ends up at church with Mercedes and watches as the whole church prays for his father to recover. Getting him into church may look like an act of evangelism, but it’s just an act of love by a friend to show that others care so much for people they’ve never met. We don’t know if it changes his opinion of religion, but hopefully it brought him some comfort. Sue Sylvester – Glee’s most delightfully awful character – comes to blows with the rather weedy Guidance Counsellor over why she’s an atheist. As a child she prayed that her sister (who was born with Downs Syndrome) would get better, but because she never did, so Sue decided that God couldn’t possibly exist. Ironically, it’s revealed that her sister does believe in God and prays for Sue. They’re all totally logical responses. Who (amongst the churchgoers reading this) hasn’t been given a pebble, rosary, picture or icon with which to direct or focus their prayer? (I’m sure there was a period in the 90s when you couldn’t get through an ‘alternative’ act of worship without being given a pebble.) Persistence in prayer is one thing – desperately praying for your heart’s desire to be fulfilled and it never happening is quite another and phenomenally painful. How do you argue for the existence of God in the face of that? Personally, one of the hardest things I’ve found is comforting atheist friends when my natural response with other Christians would be to say that I’d pray for them – often it’s not what they want to hear. There’s obviously a lot more that could be said about this, but I’m not entirely sure that I can be this serious about Glee for any longer! I would just like to state for the record that the one thing that did not impress me was the use of One of Us (the mid 90s one-hit-wonder by Joan Osborne) – slightly obvious and a song that has not left my head ever since. Given that the episode also included some classic REM and Bridge Over Troubled Water, you might realise why I’m peeved. Today’s fun is in honour of my parents – for two reasons. (i) On this day thirty years ago, on an island far, far away, my Dad was ordained. (ii) It’s my Mum’s birthday on Tuesday. I didn’t get that much notice on number 1 – it’s not a date that features in my diary (though this year I’m writing it in, because having had the 25th and 30th catch me by surprise, I’d better be ready for the 40th!). This meant that I didn’t have enough time to get to a religious bookshop and scope out a suitably cheesy ordination card. Trust me, such things exist. If I was a truly devoted daughter, I might even have headed over to Ship of Fools for some classic religious tat – I’m thinking he’d particularly like God Trump Cards (individuals whose views might trump God’s skills…), or perhaps some fridge magnets depicting the various components of Mass. Oh, so many things to choose from! Lest you be thinking ‘but who would actually want such religious tat?’ I should point out that in my kitchen there is currently: a Jesus on a spring; Jesus pencil topper; and a Virgin Mary toast maker – my atheist friends never fail to reaffirm my faith in their gift-giving! In honour of my mother, I’d like to share this particularly wonderful story from Passive Aggressive Notes. A girl, still living with her Mom, writes a blog which her Mom reads. 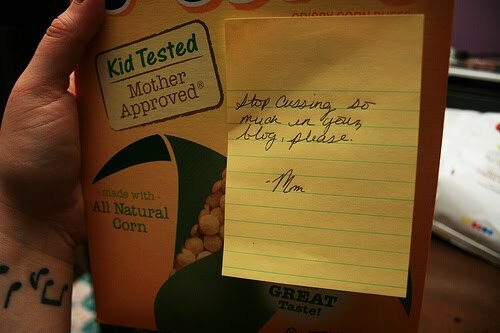 Sometimes her Mom wants to comment on its content and rather than use the comment form or even have a conversation about it, she chooses to leave notes for her daughter in random places – like a cereal box. Wow. My parents read this – sporadically, I think – and occasionally it gets mentioned, usually in a ‘I hope that’s not going to end up on your blog’ way. I think Mum feels mis-represented, and I do apologise for this. So, for the record I’d like to say that any mis-representation has been unintentional. It’s really not my fault that my parents are good at providing comedy blog fodder. After all – they created me and my sense of humour, so it’s all their fault really. Oh, and love you! Her wedding dress looked very little like the one I found in my cupboard. She doesn’t think I’m obsessed with shoes, she’s just not sure that I’ve got over the trauma of being a teenager with size 8 feet at a time when size 8 shoes were difficult to come by, and therefore tend to buy more pairs than I might need. Erm, there was also some issue about my saying that she was exasperated at my lack of single male friends but I can’t remember what she was particularly concerned about – I think it was more of a misinterpretation of what I’d written. I may sometimes paint a picture of Mum being a little bit like Bridget Jones’ Mother – desperate to set me up with someone, but she most definitely isn’t. I’m sure that whilst I was at the office this morning I had three different blog inspirations to choose from. However, a 2 hour journey home (which should’ve taken 45mins) seems to have drained them away. One was going to be a fabulous theological discourse on the amount of influence God is allowed to have on the President of the USA. So, what I intended to do was waffle on about the relationship between church & state, especially in a legally secular, yet obsessively religious country like the US. Would this even be an issue in the UK? Would people mind if we had a PM who publicly said that they listened for God’s guidance in matters?